Necklace choker in sterling silver + citrine. Hallmark "boar head" (French punch for money 800). Length of the pendant: 8 cm. 1,6x 1,2 and 1,3 x 1,1 cm. 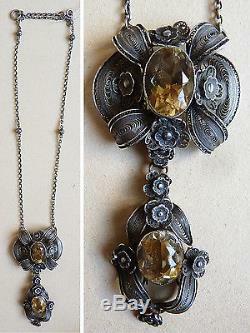 Jewel of the late 19th / early 20th century. Some small accidents on the watermark of the pendant. Hand delivery possible at home in Paris 9th. The item "Sterling silver filigree pendant necklace and antique jewel citrine circa 1900" is on sale since Friday, November 11, 2016. It is in the category "art, antiques, xix and before". The seller is "vakano" and is located in / in paris. This item can be delivered anywhere in the world.